If you’re new to the world of ammunition reloading, it’s easy to become overwhelmed, or to be concerned about where to start. The good news is that with just a little instruction, you can easily learn to take advantage of the money-saving and accuracy-increasing benefits that reloading has to offer. It should probably come as no surprise that a good reloading process starts with the right press. Did you know that there are three types of presses? There are single stage, turret presses and progressive presses. Grab A Gun carries all three types. The primary difference between the types of loaders is in the number of rounds you need to be able to turn out in a certain period of time. Single stage presses are the best choice for those new to the reloading process. Turret presses can be used to generate larger batches of ammunition, sometimes as many as 200 per hour for an experienced reloader. And for those with the need to load very large amounts of ammunition, a progressive press can give you as many as 500 rounds in an hour. If you’re unsure of the type of press you need, give us a call. The customer service representatives at Grab A Gun can point you in the right direction. 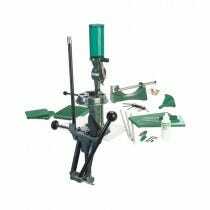 And take a look through our selection of press-related components, such as shell holders and priming tools. If you need it for reloading, Grab A Gun can help. Our inventory reflects our continuing dedication to being a great partner for our customers, whether they need a reloading press, a firearm, or any number of our firearm-related accessories. At GrabAGun.com, our goal is to earn and keep your business for years to come.